This article is from the July/August 2004 issue of Dream of Italy. Updated 2018. With the backing of a luxury goods company, a location in the heart of one of Milan’s most exclusive neighborhoods, bell hops who could (and probably do) double as male models and elegant, modern decor, I expected the brand-new Bulgari Hotel to be, well, how can I say this, a bit cold. I was completely wrong. No matter that I inadvertently arrived in the sleek, modern, black marble lobby in jeans and running sneakers (yikes, can you say American? ), I was treated to a warm welcome and a genuine interest in my stay in Milan. The hotel had been open for just 10 days and while this might have accounted for the enthusiasm of the staff, I like to think they will be just as friendly a year from now. I knew this hotel stay was going to be different when my taxi driver turned on to a private road and checked in with a security guard. Set next to Milan’s botanical gardens, yet just steps from Armani‘s flagship store, the Bulgari is a resort oasis in the middle of a bustling city. Most of the guest rooms have views of the hotel’s lovely back garden which turns into an already-popular-with-the-chic-locals outdoor lounge in the evenings. My surprisingly cozy room was decorated in a palette of black, beige, white and tobacco. It had a walk-in closet (there’s a free unpacking and packing service), a black leather desk, a movable flat-screen television, a Tivoli CD player and two plush, pillow-strewn beds. I often judge hotels on the quality of their bathrooms. Although it may sound cliché, when I walked into mine, I thought I had died and gone to heaven. The well-lit and airy marble bathroom featured a large tub, bronze-accented shower, separate toilet area, thick white towels and a slew of sweetsmelling bath products from Bulgari’s Green Tea line. There was also a large window overlooking the garden. Next to the tub was a bath menu, in case I wanted a staff member to whip me up a relaxing aromatherapy bath (for an additional fee). Even luxury travelers who are paying a small fortune per night, don’t like to be nickel-and-dimed and I was pleased that the hotel offered free Internet access on the plasma TV as well as the complimentary use of a laptop computer. I knew this hotel was truly focused on the details when the chocolates I received at turn-down were so luscious that I saved the wrappers on the side table so that I could remember the brand name, Babbi. The housekeeper noticed my enthusiasm and returned to my room one night to give me a few extra. This winning combination of detail and service extended to the bottle of water the front desk clerk handed me as I left for the airport. It was like she had read my mind. Room rates start at 900 euros, per night. For those who want to stay in the middle of the shopping district, but who don’t want to pay the equivalent of a Prada bag for the privilege, the Hotel Manzoni is an ideal choice. On a quiet street just off of Via Montenapoleone, the Manzoni offers one of the best deals in the entire city. There’s a bar and television lounge just off the lobby. The guest rooms are small but functional with simple, yet attractive décor. Some of the rooms have balconies. All have television, hair dryers and air conditioning. Don’t expect bath menus here as the bathrooms contain showers only. Travelers renting cars and heading off to the Lakes or other destinations should take note that the Manzoni has an attached garage where guests can park for an additional fee. 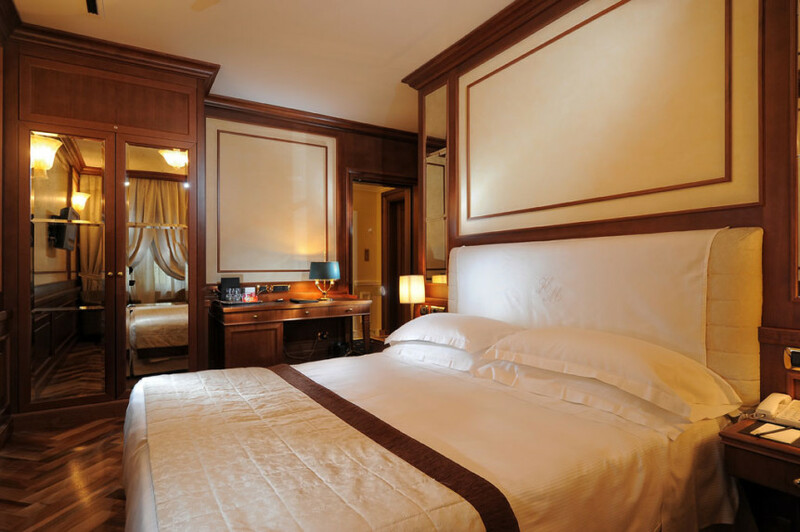 If you’re planning a visit to Milan, make your reservation at Hotel Manzoni as soon as possible. The word is out on this affordable gem. One travel agent I know has never been able to book a room here, while I was able to secure a last-minute reservation at the beginning of June. Double rooms start at 290 euros per night.